Work order template software simplifies the work order creation function by automating the plant maintenance software role by managing work issuance. 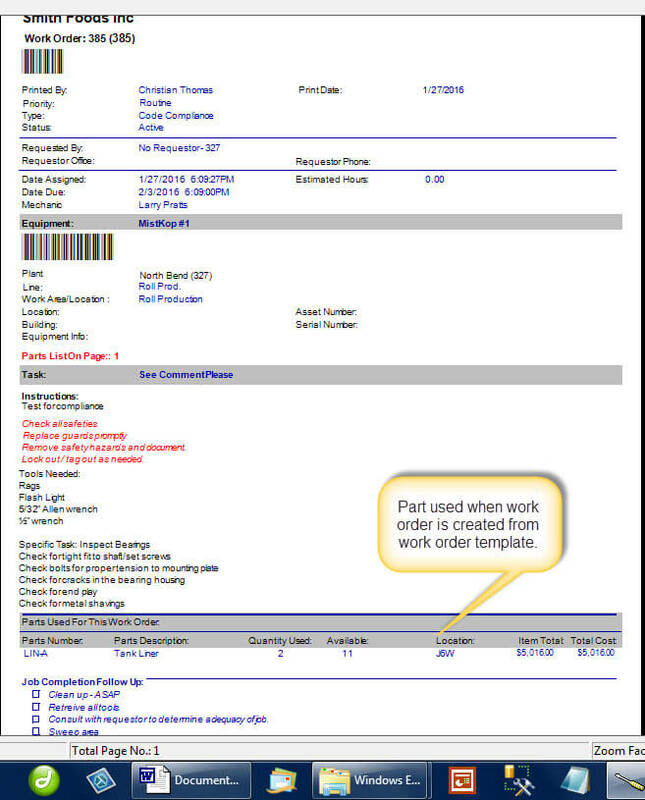 Work order template software automatically creates work orders and preventive maintenance task lists from a boilerplate template. Additionally, this saves time, and consequently money while providing a consistent way to issue work orders. To begin with, create a work order template from an existing work order with one button click. Next, use a schedule, meter or other method to trigger a new work order from the work order template. Consequently, this new work order is identical to the template other than having a new start and due data and a different work order number. Consistent issuance of work eliminates mistakes. Automatic issuance of new work orders save time. Simplifies the work order management process. Create a work order based upon a schedule. Generate a new work order based upon equipment demand by using a meter. Create many work orders at the same time. Work order template software is also useful for managing preventive maintenance. Whether calendar-based or meter-based, preventive maintenance management is simple using work order templates. Additionally, link unlimited spare parts to the template. 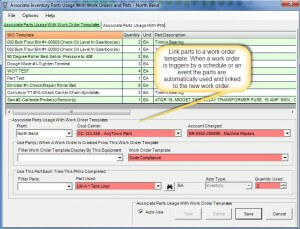 Triggering the template draws the spares from inventory automatically and links these spares to the work order. In short when properly used, work order template software relieves the maintenance manager of a substantial portion of his/her daily workload. Manage preventive maintenance by the exclusive preventive maintenance system included with MaintSmart, or with work order templates. Most organizations use both methods depending on the application. Work order creation is completely automatic when using work order templates. Create a new work order with file attachments (these also auto-print), parts lists, unlimited details, SOPs and safety instructions from a work order template. The plant maintenance software implements a print (or email) scheduler. This scheduler triggers most reports in the CMMS including history reports, preventive maintenance task lists and most importantly work orders from work order templates. Using work order templates for repetitive work, preventive maintenance save the maintenance manager time and adds consistency to work order issuance. 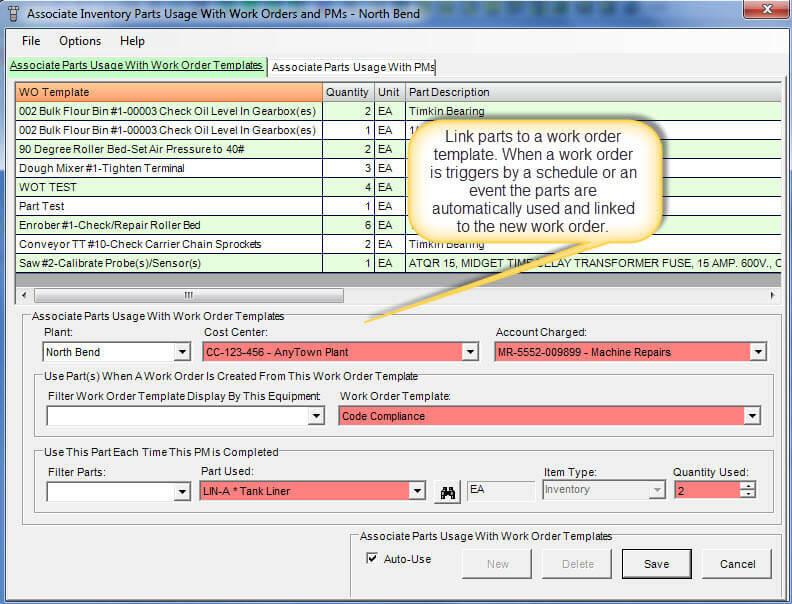 Link work order templates to meters for automatic demand-based work order generation. What is a meter? A meter is a unit of anything the user defines. Examples could be "Every 1000 Cycles", "Every 6 Months or 6000 Miles" (one meter definition with two triggers) and so on. Assign up to six (6) triggers to each meter definition. The trigger that reaches threshold first triggers the work order template to create a new work order. How to Create a Work Order from a Scheduled Work Order Template. Use a Metered Work Order Template to Automate Work Orders. All scheduled repetitive work no longer requires the maintenance manager's time. All metered work is automatically entered saving the maintenance manager time. Work orders created from templates are always identical to template reducing mistakes. and human error. 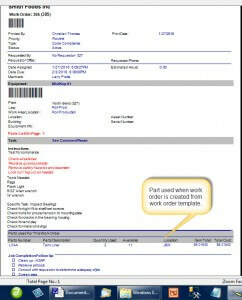 The work order template software capability is a money-saving and time-saving feature. Link spares for automatic usage to work order templates for yet another time-saving benefit. Spare parts are used automatically from stock when the new work order is created. Furthermore, the parts list displays on the new work order. Additionally logging of the parts used occurs. This creates a parts usage log of who, why, where and what. Inventory is automatically reduced and the parts are attributed to the work order number, the equipment item and the technician that in named as the lead technician on the work order. This is all automatic. Additionally, automatic parts usage is turned on or off by the maintenance manager as needed. For example, in some case perhaps the parts list should only be displayed but not automatically used from inventory. Returning previously automatically used parts is as simple as editing the parts used quantity or deleting the parts used record altogether. Another time-saving feature found only in this work order template software is the ability meter updating to occur automatically. This is done through an OPC compliant network connecting your equipment PLC to a workstation that is running the CMMS. Think about this your equipment is now capable of telling the plant maintenance software (CMMS software) when it needs service and MaintSmart responds with a work order automatically.